In June, Governor Hickenlooper issued an Executive Order ("Maintaining Progress on Clean Vehicles") that says that the federal government intention to, "roll back vehicle greenhouse gas and fuel efficiency standards for model years 2022 and beyond. ... could also have serious consequences for Colorado's efforts to meet out clean energy goals." Hickenlooper thus ordered the establishment of a Colorado low emission vehicle (LEV) program that would incorporate the requirements of the California LEV program. On August 16th, the Colorado Air Quality Control Commission (CAQCC) debated a proposed rule that would require, starting January 2021, all new passenger cars that are sold or leased in Colorado to match California's rules for new car emissions. By making Colorado's rules the same as California's, it would not add any additional burden to the auto industry (since automakers already work to meet California's rules) but it would add another state to the list of thirteen that has already adopted California's Low-Emission Vehicle (LEV) standards. The jurisdictions standing in opposition to the Trump rollback represent a sizable share of the U.S. auto market. The 13 states implementing the Low-Emission Vehicle standards represent 35% of US vehicle sales. Adding the states who have either joined the litigation or vowed to reduce their greenhouse gas emissions brings the total to 49% of US vehicles. Adding new vehicles from cities voicing opposition to the rollback (outside the states already counted) means all these climate-protecting states and cities amount to 55% of the U.S. auto market. Freezing CAFE would stifle technological progress…a lot. 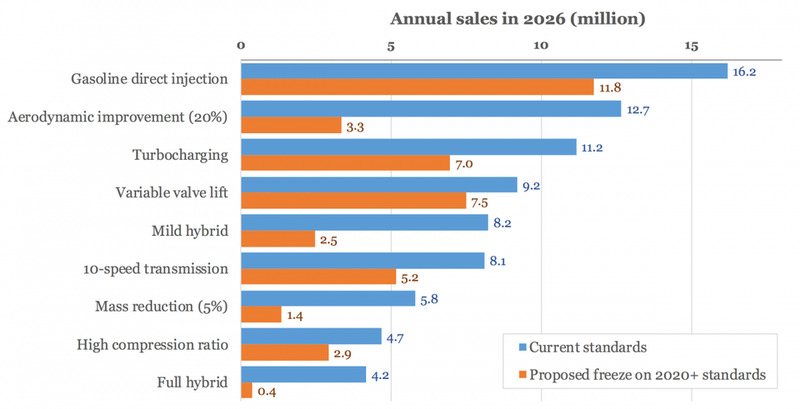 The figure below, taken from Trump’s National Highway Traffic Safety Administration analysis, compares projected annual sales in 2026 for various technologies under currently planned standards with projected sales if standards are frozen at 2020 levels. We can see that the regulatory rollback will leave us with 7 million vehicles with turbochargers in 2026 instead of 11 million, and 0.4 million hybrids instead of 4 million. You can also see considerable lost opportunities with other efficiency technologies. The differences are stark indeed. The Trump EPA’s latest proposal, however, demonstrates that this new brand of cooperative federalism comes with a huge caveat: Cooperative federalism is the goal unless a state or local government wants to go above and beyond federal standards to protect the local environment and public health. The Trump administration’s decision to try to weaken President Barack Obama’s landmark 2012 agreement to increase fuel efficiency and decrease global warming emissions from automobiles is dismaying on so many levels that it is hard to know where to begin. by Governor Andrew Cuomo: The Trump administration is proceeding with its irresponsible plan to roll back federal emission standards for vehicles. Make no mistake: As intended, this rollback will enrich the oil companies and industry lobbyists that are cozy with Environmental Protection Agency leadership, while harming our environment and just about everyone else — people who prefer clean air, auto manufacturers and consumers. The Trump administration on Aug. 2 formally announced a proposal to freeze fuel economy standards and tailpipe emission standards for new cars. In addition, it is proposing to revoke California’s authority to set more stringent rules. This move by the Environmental Protection Agency and the National Highway Traffic Safety Administration, while expected for months, is the most significant action yet in rolling back efforts by the Obama administration and California to cut greenhouse gas emissions that contribute to climate change. It also sets up an unprecedented legal battle between California and the federal government while breaking with decades of practice on regulating tailpipe pollution.